The Simon and Garfunkel Story comes to St George’s Hall in Bradford this October prior to its West End appearance next year and 50 years since Paul Simon and Art Garfunkel recorded their first number one hit single, The Sound of Silence. Featuring West End, award-winning leading man Dean Elliott (Buddy Holly in Buddy - The Musical) and a full cast of talented actor- musicians, The Simon and Garfunkel Story takes you back through the 'Groovy' times of the 1960s. It tells their story from their humble beginnings as Rock n Roll duo Tom and Jerry, right through their massive success and dramatic break-up, finishing with a stunning recreation of the 1981 Central Park reformation concert. Using a huge projection screen, the show features both original photos and film footage whilst a full live band perform all their hits including Mrs Robinson, Cecilia, Bridge Over Troubled Water, Homeward Bound, Sound of Silence and many more! If you're a fan of beautiful music then this is an evening not to be missed! 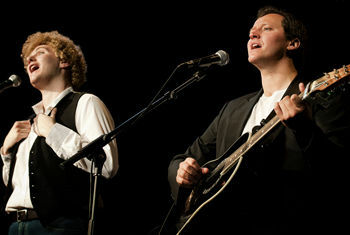 The Simon and Garfunkel Story is at St George’s Hall on Thursday 16 October at 7.30pm.